Below is an edited version of that chat with Una of Una Hats, Emily Moe of MoeSewCoMillinery, and Silverhill Creative Millinery. This chat was held before Etsy made it's changes to categories (like literally a week before!). I followed up with Emily afterward to see if these were positive changes and the answer was yes and no. Some more hat categories popped up, but other items still were without a category home and some new items lost their category home. If you want to help milliners, to sum up the ladies, just wear a hat! Would each of you be able to give your name, shop name, how long you've been making and your website? I'm Emily Moe. My shop name is MoeSewCoMillinery. I've been making hats for slightly over a decade I think. So, why do milliners have unique needs on Etsy and other platforms? I think it's because there are so many kinds of hats. And we can't really all get thrown in a barrel and compare. By that I mean, there are knitted hats and millinery hats. Etsy's categories in no way help people know the difference. I was thinking about this in comparison to other types of fashion. People know that the word "dress" is broad enough to mean a gown, a cocktail dress, a work dress, a casual sun dress. But with the word "hat," unfortunately a lot of people's brains only go to ball caps and knitted hats. And people know to differentiate those dresses. What we need is the ability to differentiate. Right, can you explain a little what a millinery hat is vs a knit hat? Millinery is the art of thoughtfully hand crafting a beautifully made hat from a variety of materials such as fine woven straws or beautiful lush wool, or fur fets, In my cases I hand block and shape the material over vintage hat forms to create a shape and then reinforce and trim or decorate the final shape. It can take anywhere from 4-8 hours over the course of 3 days. But there are many different techniques that involve loving craftsmanship. Our hats have shapes. I think that might be the easiest way to describe it. We work with high-grade materials. Fur Felt. Very high grade straws. And a mysterious substance called buckram that helps you make any shape you dream of. Does Etsy help people differentiate with other articles of clothing? Why is the differentiation such a big deal for milliners? Yes. They have many categories of dresses. I'm not convinced that Etsy's categories aren't kind of junk even outside of hats anyway. If you're a dressmaker, do you list yours as Clothing>Women>Dress or Clothing>Dress>Women. Without keyword differentiation, people slap the extremely limited number of options on all sorts of inappropriate items. Too much duplication can't be helpful for buyers, and it certainly isn't helpful for sellers. If you search for a cloche on Etsy, you get a sea of knitted beanies. Knitted beanies are definitely not cloches! Definitely not. Pretty much any search with the word "hat" in it gives you a sea of knitted beanies. Oh, and yes, those are obviously different. So people are tagging cloche even though it's a beanie? Also "knitting" and "crochet" have their own dedicated super-categories that aren't even under "accessories." So you would like to see a millinery category? Yes, adding straw and felt and buckram would be a huge help! Less chance of knitted beanies ending up under those categories. And here's the killing part, we have given them these lists over and over and over again. They claim they are working on the taxonomy issue, but there's never any forward motion. But the problem is, people don't use the categories correctly anyway. I'd say "cloche," which we do have, is comparable to "fedora" or "top hat." It names a specific shape. And cloche is full of knitted hats. I think we tag inappropriately because of desperation. And even worse, there is on the 1st page of results for cloche (www.etsy.com/listing-category/accessories/hat/cloche) a PDF pattern for a crochet scarf! I realize Etsy is the largest platform for handmade, but is this a problem on other sites too? We don't fit on the other sites. In an ideal world, in my fantasy land, new categories from Etsy would come with actual monitoring of categories to make sure they're being used properly. Someone suggested Zibbet, which just copied Etsy's categories verbatim. And at this point, when someone reports these problems to HQ, odds are that their own shop will get muted. So part of the problem is the other platforms use Etsy as the model for how they structure themselves? Yes. I think so. We also have fairly high price points. Other sites — because they are smaller — have zero presence of millinery hats, so the problem of being stuck in a sea of knitted beanies and ball caps is even worse. Most people don't know what milliners do. So they don't understand the price points. This is true... the word seems old fashioned... but if I were looking for hats, I would hate to wade through a sea of beanies. Yes, I went through all the suggestions you recently listed on the Academy of Handmade's site. None of them have any millinery. And they really don't know that millinery materials (let alone blocks and equipment) are very expensive! And the price points were too low for us to find an audience. People often say that hats are "coming back". In a way they are, but in a way they never went away. When I first joined our team, there were 23 members. Now there are more than 500. Yes, and education is the key. Etsy has grown, no doubt, but our industry has grown as well. People need to know they can wear hats and that it's socially okay — and that they will look good in hats. I feel like hats are HUGE! Especially here in LA and with the Coachella set. LA has been a good but it takes time to educate the difference between a $30 store bought hat and at $150 plus hat. Part of the problem I feel with Etsy — and this isn't a bad thing on Etsy's part, unlike the categories — is that it's become too huge! There's just so much stuff here. There are gorgeous things and there is junk in every category. I'm envious of you, Una. I'm in such a small area that my options for craft fairs are the low-price-point events. And I am on the edge of the wilderness. My sales on Etsy are follow ups from markets. I am on a higher end site that supports handmade goods, they are lovely but it's still overcoming buying a hat on line if you break it down. The hugeness is definitely a problem. It also brought with it a loss of identity, character and community. Brika doesn't even have a category for hats. I wonder if Brika just hasn't had a hat seller yet. They are new. I've wondered about category changes, especially with the IPO. Theoretically selling one of your hats is way better for Etsy than an inexpensive beanie since they make more money. You would think at some point elevating the more expensive product would be in their favor. That was a problem I found on a couple other handmade sites, as well. No, what's better for Etsy is doing a *lot* of sales. I found that at every point that Etsy made a change away from the handmade values, their sales made huge jumps. Particularly when they let the manufacturers in. It's true they are going for volume right now, but I wonder if that will last. Trying to compete with Amazon/Eboy will be really rough. But also money, I know. They theoretically have a rule against resellers — buying things from Alibaba and selling them as "handmade" on Etsy. But it is absolutely NOT enforced. Right, like the tagging, I think they are very lax on enforcement. Also NOT enforced. Or they seem to think that it is, but don't pay any attention at all to people who just pretend. Which to me makes for a very unenjoyable customer experience. I was looking for stuff to "register" for my wedding and gave up immediately. Uneducated buyers might think it's real millinery. But it's mass-produced in China. I also spent some time looking at venues that might be good for us if they would change their categories and sent out some notes asking if this would be a possibility. I tried to let them know that a tidal wave of milliners was just waiting for them. So that was my next question. How do you get things to change? What are ideal changes? I think first transparency. Let the community talk about things. Let us know what the thinking is behind decisions. Then there's the categories of course. Enforcement against category abuse and resellers. Yes, transparency. Etsy bizarrely tells us that we're not allowed to talk about any e-mails they send us! If they are on Etsy, then Kristin is absolutely right. Enforcement. My absolute ideal, honestly, would be a venue away from Etsy. Even if tomorrow Etsy changed its categories, got rid of resellers, etc. Yes. That would be a beautiful thing. Yeah, I think a lot of makers would like to see a rival to Etsy emerge. A true one. Yes. A real rival would be wonderful. I think if Etsy was more transparent about who was really on there to customers and if it was much more obvious what was handmade, most people wouldn't have a problem. I have heard from so many people from all categories wishing for a new home. My absolute dream would be a handmade *fashion* site that was juried. If it grew and gained notice, it could be a destination. My dream site would mean that for hat-sellers, you are not competing with people who glue feathers onto mass-produced hats. For clothing-makers, they are not competing with somebody with a Hanes t-shirt and an embroidery machine. I think the thing is when anything gets to big, it gets really hard to monitor. Etsy has changed, I am a newer seller but was aware of the over saturation and other issues but at the end of the day it is just one tool for me. I think of Etsy as an easy way to add e-commerce capability to my business, without having to buy an expensive, dedicated e-commerce platform. Yes, I 100% don't think of Etsy as a place to get found. Honestly, in the past couple of days, I've had a huge number of views (due to being featured in a treasury and then favorites leading to other favorites, etc.). But that hasn't led to any sales. I know a couple of people that are toying with starting something. One of them is quite serious about it. I assured him that crowd funding would be abundant for such a project. There are so many desperate makers. I think a place for handmade hats only would be very interesting. Then it really sets apart what millinery is and isn't. There are, actually. Sites just for millinery. But because they're just about millinery most people don't know about them. And not as easy to use. Well, I guess this leads into the next topic too... how do you get found now? Neither do I. I have these three flannel fascinators that are so cool they should be flying off the shelves. They're also cheap because flannel is cheap. But I have no clue how to get them seen by the people who need to see them. My sales are from people who are not Etsy sellers themselves. So I have no idea how the people who have bought from me did find their way to my shop. How do you attract a hipster? You certainly can't use the word hipster! aha! Emily, the first rule of being a hipster is never acknowledging you are one. But I bet a word like coachella would help? or something hipsters are into. For me I was lost on etsy so I decided to evaluate what i love doing, my strenghts, and i love being in front of customers so I spend my time carefully picking shows to do. Una you are lucky that you can. I'm going to be consigning more. I also love visual graphics so I spend time because I love it on instagram and pinterest. I'm consigning in a shop in NYC, a box of fascinators is on its way to France, and I've been invited to consign on Fashion at the Races. Consigning makes me nervous. I've heard so many horror stories of hats not selling and coming back wrecked. Well they're not selling here. So I figure they can sit on someone else's shelf instead of mine. And I have to try something new because something old isn't working. Is your wholesale market also very limited? Yes. I actually don't know anybody who has pulled off successful wholesale. I think most retailers don't want to take a risk with committing to wholesale. wow. that's kind of crazy. I still find the biggest hurdle for us, is buying a more expensive (excellent quality) hat online. It's a scary thing. Especially if you don't love it, or it doesn't fit. I get it. I always back my sales up with a note that says that if it doesn't fit, I will fix it. I offer my customers the option to return (in sellable condition) if they don't like it. Thankfully, no one has! Well, people still buy other things online that are expensive all the time and send them back. It just must seem riskier with a hat because they are even more unsure for some reason? I feel like I have to give them something that assures them that I stand behind what I do and will make them happy. I think there's a difference between sending an expensive pair of shoes back to Zappos.com and sending a hat back to the individual maker. I think maybe being on Etsy itself gives a certain amount of assurance. And that's why we stay. I remade a derby for a customer 8 times before i got it right. He has since purchased two more hats. I don't always trust teensy web sites. So I wouldn't expect a buyer to trust my little site. Etsy does give some level of reassurance to buyers. I guess that's thing then... it's just getting found! Also the big milliners have considerably higher price points than we do. So wholesale can make more sense. If I had a BRAND, my fedoras would be more like $400 instead of my $160. And they're probably not being discovered online. So having a big name means a lot in the hat world? Right. Oh yes. Quite a lot. They're probably being seen in a high-end boutique, and then purchase is made online. Way before I started making hats, I discovered Goorin hats in a Nordstrom while on vacation. I didn't buy the hat, but I looked up the web site and then became a Goorin customer. That's probably a similar pattern that plays out for high-end hat-makers like Eugenia Kim, et al. I did a trunk show at Goorin Bros. They were very generous to have me. Yes, high-end people do have higher overhead. But for us small-scale hat-makers, it's harder to get found in the real world. What do you think is the future for milliners? Staff. Buildings. Instead of me alone in my dining room. I believe that our industry is going to continue to grow. I don't aspire to having staff. I want to be like Kelly Dunlap aka The Saucy Milliner. I've lately been aspiring to have a helper. We have a lot of hurdles to overcome. But when I look back at what we were five years ago and what we are now, it's extraordinary. I look at national trends though and I see hope. My 2014 started off with a bang and then declined. My 2015 ... *sigh* I think that one thing that is tricky for us is to get featured in the e-mails and stuff from Etsy. Whenever they do feature milliners, it's always the same three. Well, but I feel like I know lots of people who get featured on these things and it really does very little for their shop. And they hardly ever feature milliners. Look away from the couture people and catch a glance at all the hipsters wearing vintage clothes. They want hats. It's all the same stuff from Etsy. If I see one more resin bangle with gold flakes, I'm just going to ... yawn. And so Goorin Bros has expanded to loads of cities in the last year. I have people on the edge of the wilderness wanting to learn to make them in droves. I meet so many younger people who have a real appreciation for dressing, what ever style it may be. And in a sense, mass-produced hats are not the enemy. The more people wearing hats, the more people who will wear hats and work their way up to finer millinery. No. A good friend is the head of the millinery department at Target Corporation. That's very true. Different price points are always helpful in every market. We've had a lot of chats about this. She's a very good milliner. Very good designer. Does high end stuff. But she has made her peace with her job by seeing those Target hats as entrance points. The thing is they are young and may not have the budget for it right now. I get I'm a mom and was a student too. So I encourage them to just get a hat even if it is from a thrift store or a larger mass produced hat. And when they are ready they can buy a quality hat. People who discover they love wearing a $40 hat they bought from the Gap might eventually take the leap into higher-end stuff. Yea. Most of my students make their one hat and discover how hard it is, and then are ready to shell out the big bucks. It's like anything else... people will always buy handmade for many more reasons than price. Yes. I get a lot of people with big heads. Exactly kristin i started with cheap hats that fit me poorly and decided to learn how to make them. I have a huge head. I love getting people excited about hats. And it's ok to have a collection of high end and lower end hats. Hell just wear a hat. With mass-produced hats, if it gets wrecked, you just throw it out. With quality millinery, not only do you want to save it ... it's also more likely that it can be saved! That's something that beanie makers and mass-produced hats can't offer. So the future. I think it's good. I think that someone with money will realize how many makers are ready to jump ship and will come up with something. I have hope. Yes and they never look good over time. But it's like handbags or shoes and just educating the difference. Well, I know you guys have tried to do some advocating and lobbying on your own behalf. 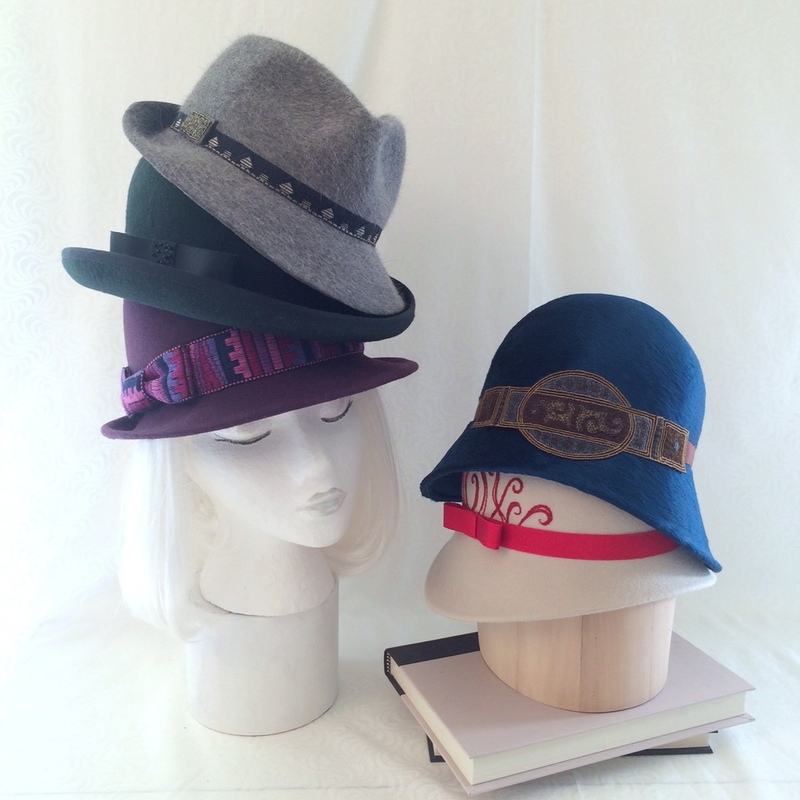 What can other makers and consumers do to help milliners? Feature hats in their product shoots. Well, send in emails and convos to Etsy about the categories, obviously. Consumers can get educated about what a good hat feels like. If someone sees a dress they love and it's being worn paired with a hat, the person buying the dress might think "Ooh, I need a hat to go with it." Be brave and don't just say that you wish everybody wore hats. Do it. I had that conversation with a woman on Thursday. She said she's scared to wear her hat because nobody wears them ... and was saying that she had meant to wear her hat to this event because she knew I at least would be wearing one. And somebody out there with the website developer chops... we need you and we will give you money. I said, "Just wear your hat! And here's how you do it: Wear the hat; don't let it wear you. If you walk down the street thinking, 'Heck yeah! I'm wearing this hat. I'm owning it!' people will love it. If you walk down the street thinking, 'Oh my god, people are going to think I'm weird. Don't look at me.' then people will stare in a not-good way." Just wear them. That's very very key. I think of our hats being comparable to this fashion designer www.etsy.com/shop/iheartfink Higher price points. But also much, much higher quality. Maybe this is why more younger women are wearing them... they are more comfortable being bold like that? I think people should see what they wear as art. Good point. I like hipsters. They buy my stuff. But ironically, they aren't the ones in my classes. I've only had a few. Most of my students are middle ages or above. I think another thing is stopping the negative stereotyping of hat-wearers (especially young male hat-wearers). I hear the phrase "douche in a fedora" far too often. Yes, those anti-fedora sites are pretty obnoxious. Hold up. I'll find one. I hear a lot of commentary that the only men who can "get away with" wearing a fedora are cheesy hipsters or Cary Grant (i.e. a vintage man in a tailored suit). Men should dress better. Men should realize that women like it when men dress well. My husband wears hats all the time! Ok! Yes it frustrated me too! And his are 90% from Goorin because I don't have men's size blocks yet. Mine is known as the fiddler in the hat. He has a great homburg. Are there any other ways people can support milliners? Put us in your shops. Consider wholesaling. That would be nice. Yes. Above all things, wear hats. Compliment people wearing hats. Don't criticize people who do. I think if quality makers give shout-outs to other quality makers, that helps. Obviously it's not their job. But the more we can support other REAL, QUALITY hand-makers, the better it is for all. Etsy has a rule against resellers, but they will never kick them out. OK, do you have any other final thoughts? Someone could give me a million dollars to spend on the handmade community. I'd be really good at it. Please Etsy, don't censure us for saying these things. With the exception of the categories issue, I think many of the problems plaguing milliners are plaguing other hand-crafters. Yes. That's why we need the guy with the developer skills to come forward and grab the opportunity. That is: competing with low-priced resellers and trying to educate people on the time and materials cost that goes into high-quality handmade items (that aren't assemblages). On a positive etsy note. It gave me the opportunity to try and make that leap. I don't think I would of done it hat there not been an etsy. No. None of us would be here. I have learned so much from my team it's astounding. And I definitely would not be selling. I think that's why we get so mad. We love the place. Milliners can definitely join the team. I think eventually we'll need to take it off Etsy, but it can be a really good place to problem solve and advocate for our industry. Sometimes I wish the team could be like a trade union. Those I linked above are two knit/crocheted pieces that are far, far from the usual beanies that look like something your grandma gave you for Christmas and got stuffed under the bed by January. I would be honored to be seen among them in a less cluttered field. Buyers can search by price, but do people really say "show me hats over $100"? You don't have to be an Etsy seller to be on the team. You just have to have made a hat-- be able to prove it-- and you will need an account. We need a way to denote high-end hats (other than just sorting by price). i don't know if a few of you are close, but I've made friends with local milliners and we support each other all the time. It's really nice. Yes, but that all tools back to the whole category thing. Una, I live literally on the edge of the wilderness. There aren't any other milliners for miles and miles and miles. I find it a lifesaver because we work alone. It helps my brain. And its nice to split supply orders and booths etc. I always say I have a love-hate relationship with Etsy! I have an ongoing chat on FB with a few of my milliner friends that I know from the team. We hang out and help each other even though we're half the continent apart. Well this is the mom in me. Take the thing you love and the thing you hate find another way around…which you guys are promoting. Etsy gave someone like me an opportunity I may not of had before. It made it easy to just start. Etsy has, is and will always be changing , any business growing will. Even though there are things not working for me...like getting lost in searches, I'm still grateful for the platform, and it's only one of the tools I use. I would love for Etsy to have more specific categories but over time will those categories get oversaturated too. Who knows- it just means I have to find ways to get out there more like social media, network with other makers, like today and meet people at markets and let them experience the happiness of a quality hat or headpiece. I'm figuring it out along the way. I guess like many others.